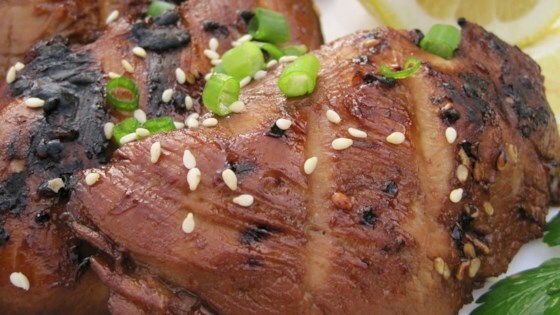 "Chicken breasts marinated in teriyaki sauce, lemon, garlic, and sesame oil, then grilled to a tasty finish. Very easy and great for a hot summer's evening. Leftovers are great on a green salad or sandwich. Be sure to grill very hot and very fast!!" Place chicken, teriyaki sauce, lemon juice, garlic, and sesame oil in a large resealable plastic bag. Seal bag, and shake to coat. Place in refrigerator for 24 hours, turning every so often. Lightly oil the grill grate. Remove chicken from bag, discarding any remaining marinade. Grill for 6 to 8 minutes each side, or until juices run clear when chicken is pierced with a fork. Very easy to prepare and so so results. I found the Teriyaki taste to be too strong. I only used 1/2 Cup of the Teriyaki so I can't imagine what the full amount would be!! This was wonderful. I used chicken leg quarters and grilled them and they were wonderful. If you don't use breasts, marinate them a little longer. I will use this recipe from now on. Wow, this recipe was really easy and tasted great. I slow cooked the chicken on the grill and it really kept all of it's flavor.